The Pakistan Air Force (PAF) will send 19 of its aircraft for a bilateral exercise in China – Shaheen VI/6. This will be the PAF’s largest force detachment to date. The news was disclosed by Pakistan’s Defence Attaché to China Brig. Gen. Ahmed Bilal to the China Global Television Network (CGTN). Following Shaheen 6, Brig. Ahmed Bilal told CGTN that Pakistan and China will conduct a series of bilateral defence exercises between their respective navies and armies. Collectively, these exercises will take place for approximately 10 weeks and will involve “hundreds” of personnel. Shaheen is an annually-held bilateral exercise that rotates hosting between China and Pakistan. This iteration of the exercise will involve the PAF’s largest detachment for activities on foreign soil. 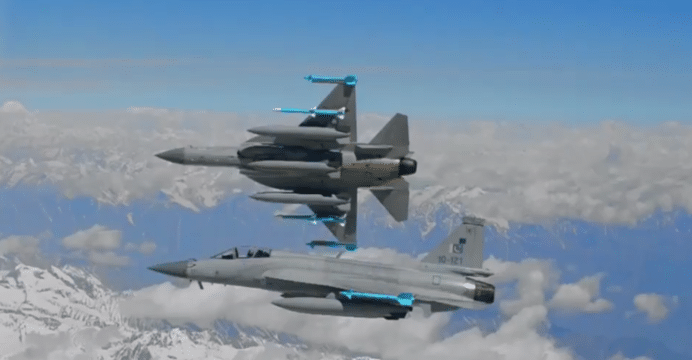 It is likely that the JF-17 will form the backbone of this detachment, which may include special mission and support aircraft as well, such as the Karakoram Eagle airborne early warning and control (AEW&C) aircraft. In previous iterations of the Shaheen exercise, the People’s Liberation Army Air Force (PLAAF) had used its Chengdu J-10A, Shenyang J-11 and Sukhoi Su-27/Su-30, Shenyang J-8 and Xian JH-7s. In China at least, the PLAAF also used its AEW&C aircraft, such as the KJ-200. The PAF has traditionally flown its JF-17, F-7 and Mirage III/5 (in multiple variants). Exercises with foreign air forces are generally sought to benchmark one’s own operational practices and technical capabilities. These exercises are also avenues for increasing bilateral defence ties, especially in terms of training and fine-tuning strategies and tactical maneuvers. Specific maneuvers can include dissimilar air combat training (DACT), combat search-and-rescue, and air-to-ground strikes in conventional operations and counterinsurgency/low-intensity engagements. Relevant to its threat environment, the PAF will seek DACT exposure with the PLAAF’s Sukhoi aircraft, be it the Su-30 and (ideally) the PLAAF’s newer acquisitions, such as the J-16 and the Su-35. For the PLAAF, the PAF will bring its exposure to current air combat practices in NATO (via Red Flag and Anatolian Eagle). In 2013 and 2015 the PAF also held a domestic bilateral exercise with the Turkish Air Force under the flag of Indus Viper. It is not known if Indus Viper 2017 will be held, but Solo Türk is expected to visit Pakistan to celebrate the country’s formation on August 14. Solo Türk had accompanied the Turkish detachment that had been sent to Indus Viper 2015.